KHARTOUM (Reuters) – More than 120 years ago, Sudanese fighters peppered the British steamer Bordein with bullets and missiles as it made its last dash up the River Nile to rescue the doomed Empire hero Gordon of Khartoum. Today, descendants of those same Sudanese have rescued the boat’s rusty shell and are busy restoring it — all in an effort to tempt the British invaders back again, this time as tourists. Sudan is looking for new ways to earn money as it faces the prospect of losing its oil-producing south following last week’s southern independence referendum. Some are pinning their hopes on reports of huge new gold reserves in the north’s Red Sea hills. Others are optimistic about another largely untapped resource, the country’s blood-stained and, to some, gloriously romantic past — particularly the spur it might give to a nascent tourism industry. Sudanese engineers found the 19th Century paddle steamer cut up into 12 pieces in a north Khartoum boatyard late last year. 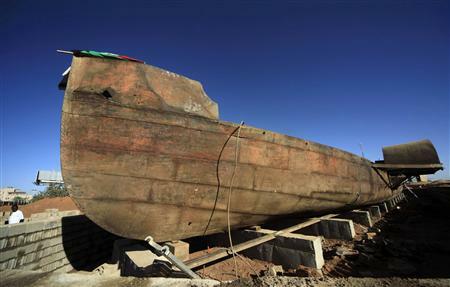 They set to work, reassembled the iron-hulled boat in four weeks and moved it close to the scene of its old battles on the banks of the Nile in Omdurman. “In the UK you are always meeting people who lived in Sudan before or their fathers lived in Sudan before. They all have an interest in coming to Sudan … Tourists can be a huge source for the economy,” he said. For now, tourism remains a tiny industry. The minister had no official statistics for numbers visiting the capital. Intrepid visitors have to fight through a forest of red tape to get in and risk arrest if they take photos without a permit. Even with a permit there are risks. Security regulations ban all photographs of bridges, a pain if you are trying to take a snap of one of the country’s main attractions — the point in Khartoum where the Blue and White Niles meet. Sudan’s frequent conflicts, most recently in Darfur, have also left it with severe branding problems when it comes to marketing itself as a holiday spot. “The war in Darfur has distorted the image of Sudan for a long time. It has obscured the real nature of the Sudanese people. They are peaceful, hospitable and engaging … They would like people to come,” said the minister. Still, Britain’s foreign ministry warns of a high risk of terrorism in the country, while the United States urges its citizens to “carefully consider” the risks of travel there. With those endorsements, it takes a special kind of traveller to book a trip to Sudan. At the moment, those include cross-continent trekkers, passing through from Cairo to the Cape, and history enthusiasts. Sudan has more, although smaller, pyramids than Egypt, left by its ancient Meroitic kingdom. Visitors have however to endure temperatures heading to 50 degrees centigrade in the summer to see them. Jump forward a few centuries and history buffs still cling to the stories of Britain’s long entanglement with Sudan. There have been at least seven films based on the historical novel The Four Feathers. The dramatic and probably inaccurate painting of Major General Charles George Gordon calmly facing his attackers on the steps of the governor’s palace in Khartoum has become an icon of British stoicism. Those memories will not be so rosy for the Sudanese who spent most of the nineteenth and early 20th centuries under foreign rulers, Turkish, Egyptian and British. “That might be true, especially in the decades that followed the colonialism, the 1960s and 70s. Now for the people of Sudan it is just part of their history,” said Barodi. There are plans for a garden museum telling the story of the Bordein — thought to be the oldest, now mostly-intact, paddle-steamer in the world. It can already be seen at its new site next to the remains of the mud-walled forts thrown up by the “Mahdi,” the Islamic leader who defeated Gordon in 1885. Khartoum’s tourism ministry has put in a request to President Omar Hassan al-Bashir to turn his Nile-side palace into a museum. Another British gunboat, the Melik, lies awaiting restoration in the parking lot of the Blue Nile Sailing Club. That project is supported by the British-based Melik Society which spent the past few years making sure the Bordein’s remains were never scrapped. Barodi is also looking for seven other boats brought into Sudan after the British came back and took their revenge on the Mahdi’s forces and stayed until Sudan’s independence in 1956. One boat, which reportedly sank on the way, is still submerged somewhere in the Nile waters. Another is thought to be mouldering away in another boat yard.